Two key Northbourne Avenue land-release sites have hit the market and the ACT Government is asking potential buyers to come up with a quality design befitting their high-profile location. A tender process opened today for Braddon and Turner on Northbourne, a combined 39,000 square metres of prime mixed-use land linking the city centre with the inner north. The Government Architect has been engaged to provide technical services to the tender evaluation team to ensure a high quality of design in the proposals. The successful proponent will also be required to work with the City Renewal Authority and the National Capital Design Review Panel prior to submitting development applications. Proposals will include a masterplan for the two sites that considers the previous Weave Design for the site, which was selected as the winner of a design competition in 2011, as well as existing site constraints, the interface with Haig Park, the City and Gateway Draft Urban Design Framework, light rail and other site opportunities. Proposals will also need to demonstrate how they will adopt a people focused approach to the redevelopment and include a place proposition plan and community consultation plan. “Canberra, and in particular the Northbourne Corridor, has undergone significant changes since the Weave design was first conceived but we still want new proposals to reflect its principals and ambitions for a coordinated precinct,” Mr Snow said. Visit On Northbourne for more information. The ACT Government’s campaign to sell premium sites along Canberra’s Northbourne Avenue corridor has been commended at the prestigious Urban Development Institute of Australia NSW Awards for Excellence 2017. The “On Northbourne” campaign received a commendation in the highly competitive UDIA Award for Marketing – Urban Development on Friday 4 August. 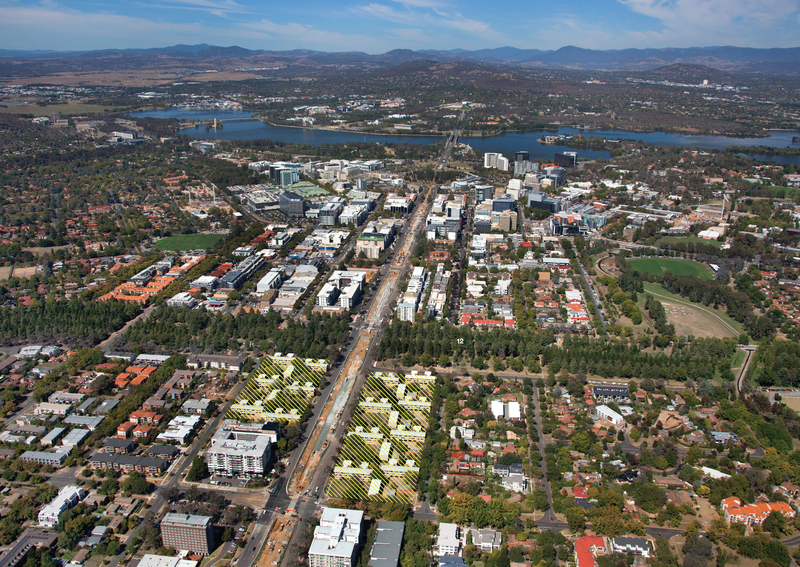 The campaigns for Dickson on Northbourne and Lyneham on Northbourne represented the first stage of an ambitious vision to transform Canberra’s gateway boulevard into a vibrant residential, commercial and retail precinct – a place that truly says “welcome to our capital”. City Renewal Authority interim chief executive Gary Rake said the award was further recognition of the transformation Canberra was undergoing. “Northbourne Avenue is an area experiencing significant growth and vitality through the Canberra Metro light rail project,” Mr Rake said. “The redevelopment of these sites will create an avenue of opportunity not to be missed – an environment that promotes a vibrant mix of residential, business and retail space and an invigorated gateway to Canberra’s CBD. “On Northbourne developed a unique wholesale business-to-business strategy encompassing four large superlots. Located along the entrance and main arterial road into the north of Canberra, their marketing demonstrated clear thinking aligned with clever execution. “Selling four large sites at different time intervals, scattered over five kilometres, meant they needed one unambiguous umbrella brand that could cope with four different suburban flavours. The UDIA NSW Awards for Excellence is a high profile, annual program that recognises and rewards excellence within the urban development industry. The ACT Government was honoured to receive the commendation.